It's finally here! In case you are wondering what this fancy new "Complexion Rescue" stuff is, allow me to elaborate (in this entire post). 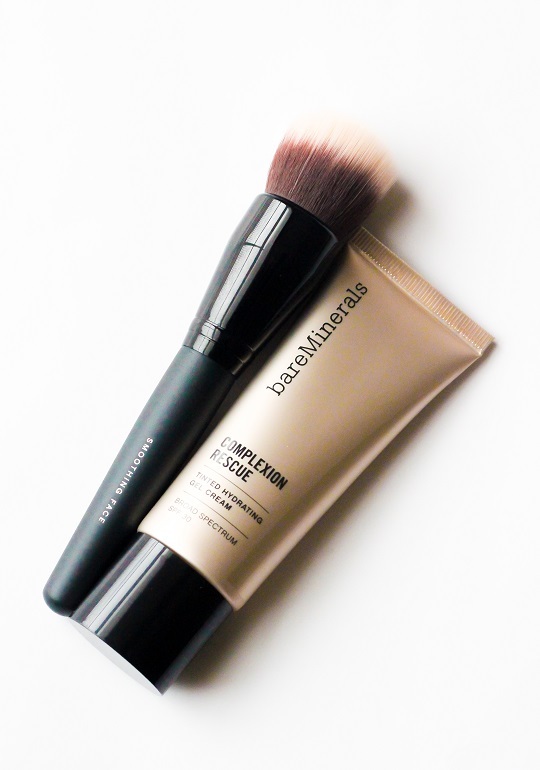 Complexion Rescue was just added to Bare Minerals line of face products. It's described as a "tinted hydrating gel cream" with SPF 30 and is supposed to improve skin hydration by 215% - yes please! 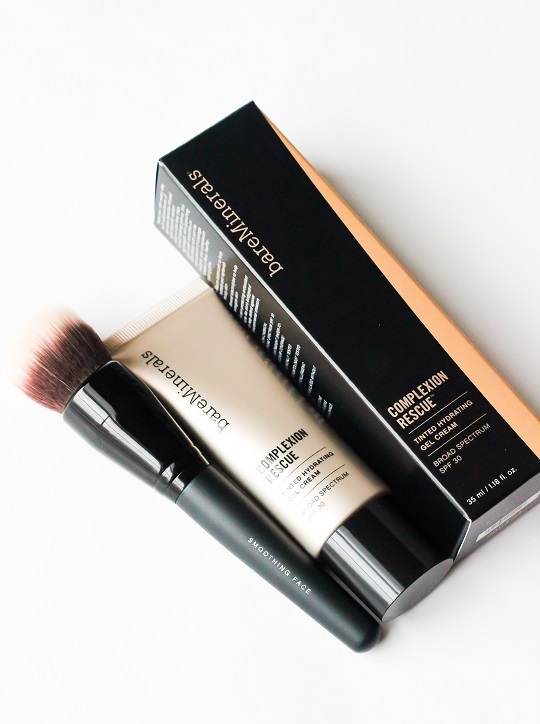 The "Smoothing Face Brush" ($28) was also launched with Complexion Rescue. It has a dome shape and dense duo fiber bristles which were designed for tinted moisturizer or foundation. The texture of this product is very unique. It is described as a "gel to cream" formula and has a finish somewhere in between dewy and matte. I love the way it instantly smooths your skin and gives a blurred appearance. As far as the lasting power goes, I wore it for three hours without noticing any transfer or need to touch up. I did a pretty intense workout and it held up through it as well...I was impressed. The application of the brush was the only disappointment I had. The Smoothing Face Brush just seemed to apply the product patchy and sheer. I switched to the Precision Face Brush and immediately noticed quicker and even coverage. If you already own the Precision Face Brush I would highly recommend using it with Complexion Rescue! Overall I'm a fan! It's a really unique product that I feel will appeal to everyone. The lasting power and finish were what really sold me! I can't wait for everyone to try it and let me know their feedback! Complexion Rescue and the Smoothing Face Brush should be launching on or before January 22nd! This seems like the perfect spring/summer foundation. Can't wait to check this out! 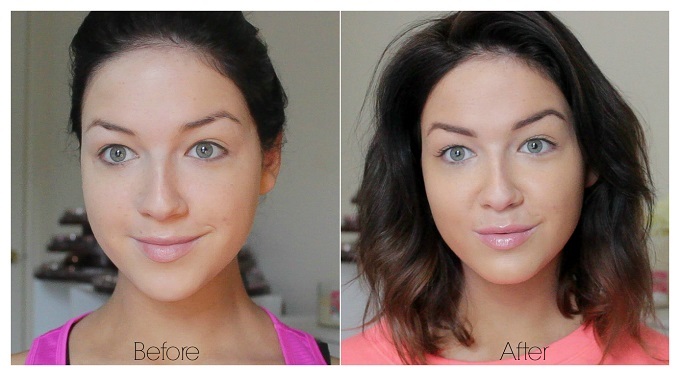 Would you say this is a good substitute for the "no makeup" makeup look? I'm really excited to try it out! I'm so excited to try this out! My hometown boutique carries this, so I'll be able to get it soon! i wear bare shell 02 in bare skin...what shade of this would you recommend? also what do you think about layering this will bare skin? Hmm. I just had to throw my Garnier BB cream due it breaking me out. I bet this would work far better. And I totally need something simpler for work. This might fit the bill. Thank you for this post! You're the best Bare Minerals inside scoop!! I've been using this for 2 days. I put it over my moisturizer. It looks great and gives me a healthy glow. Your face looks absolutely lovely! Also what lipstick/gloss were you wearing in this picture ..its stunning! thank you! So would you use primer along with this or only this product? Thanks for your videos!! Thank you so much for including the shade matches in their other products, I'm shopping online and it really helped me out! Although the comments seem a little old in case someone new was wondering, I saw online a user suggested mixing some of the foundation powder directly into your liquid face base of choice. 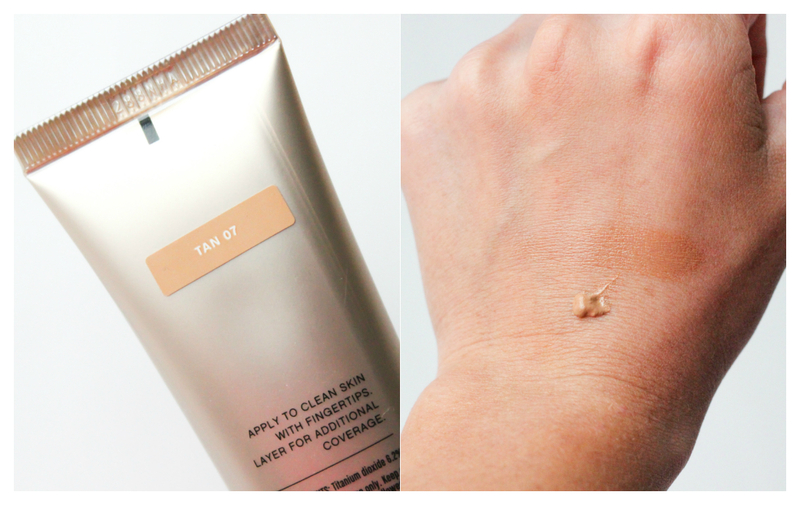 It helps to bump up the coverage, still keeps the makeup light and not cakey, helps with the staying power and it gives a satin finish to the skin. This is a tip I wanted to try out and sounds like it would be good for those of you seeking a little extra coverage. Much more gameplay controls consisting of a capacity to NBA 2K18 Face Scan - How to Guide and Solved Errors You need to confess that graphics from year to year are seemingly much better. Various groups to download and install and also set up the application. iTunes Login will certainly be produced efficiently after that adhere to these actions appropriately:. If you are thinking of doing a makeup course, but don't know from where you should do. You can check the makeup lesson by Lina Cameron. She trains the best makeup lesson in London. She is very professional in this line, also she is very helpful and friendly. She can be the best trainer of makeup lesson for basic and professional.